Is Manifest soaring or, will it take a nose dive? Has the Manifest TV show been cancelled or renewed for a second season on NBC? The television vulture is watching all the latest cancellation and renewal news, so this page is the place to track the status of Manifest season two. Bookmark it, or subscribe for the latest updates. Remember, the television vulture is watching your shows. Are you? 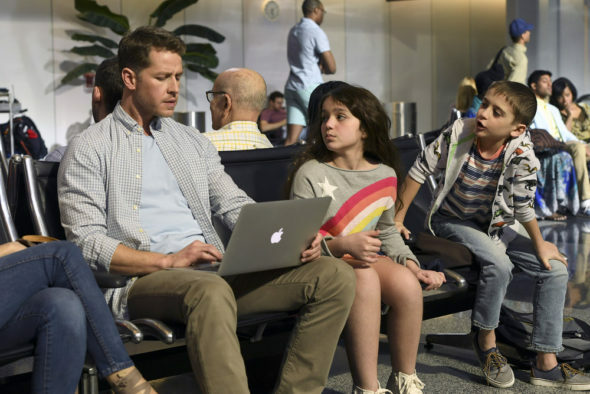 Airing on the NBC television network, Manifest stars Melissa Roxburgh, Josh Dallas, Athena Karkanis, J.R. Ramirez, Luna Blaise, Jack Messina, and Parveen Kaur. After a family vacation in Jamaica, the Stone family is returning to New York when they are separated by the airline. Adult siblings Michaela (Roxburgh) and Ben (Dallas), along with Ben’s gravely ill son Cal (Messina), are bumped to a later flight. Ben’s wife Grace (Karkanis), daughter Olive (Blaise), and parents fly ahead. The later flight — Montego Air Flight 828 — hits some turbulence but ultimately lands safely. The flight crew and passengers are shocked to learn that five and a half years have passed for the rest of the world. They attempt to reconnect with their loved ones while trying to make sense of their mysterious “second chance”. The first season of Manifest averaged a 1.25 rating in the 18-49 demographic and 6.48 million viewers. Find out how Manifest stacks up against other NBC TV shows. Manifest has been renewed for a second season which will debut TBD. Stay tuned for further updates. Will NBC cancel or renew Manifest for season two? The network ordered three more episodes, bringing the first season total to 16 episodes. The ratings started out strong but have petered out — just like Timeless in its first season. I think it will be renewed but the show could certainly end up being cancelled instead. I’ll update this page with breaking developments. Subscribe for Manifest cancellation or renewal alerts. 5/15/19 update: NBC has renewed their Manifest TV show for a second season. Find more Manifest TV series news or other NBC TV show news. What do you think? Are you glad that Manifest has been renewed for a second season? How would you feel if NBC had cancelled this TV show, instead? The show is great. Should be renewed for more episodes ASAP. Manifest is the best show ever!!! Please keep it on for many years. I love the suspense. Its hard to wait a week for the next episode. Ther will be many unhappy people if its cancelled. The show has an interesting premise, but the casting leaves a lot to be desired. Hate the Michaela Stone character. She’s so boring, and I don’t like the whole ‘you married my best friend’ storyline. The best character on the show is CIA Director Vance. He is really interesting. Wish they’d made the show center around him and his role at the CIA. Show could have been great with some new actors and a few writers that know how to build suspense. It will probably be canceled by the end of season 2. Manifest need to be renewed. Awesome show! I really like this show!! If you can keep the storyline interesting, people will keep watching! I think it’s the best new show on television. It would be a shame if they didn’t renew it. My hubby and I love Manifest! Its the only new show we are addicted to! If y0u’re a fan of interracial marriages and the LGBT agenda, even for kids toy monkeys, this is the show for you. Keep the show on. My husband and I enjoy most of the episodes!!! My husband and I watch it!!! Pleaeeeeeease don’t cancel! Just love the show. The plot line keep me wanting more. Please,please renew this show. Great show! Please renew. Great story line and acting! Just found this series on Hulu and I love it! I hope there’s a season 2, 3, 11 however far they can take it. Please renew show is very interesting and the plot line is good.